Contract disputes between federal government agencies and private contractors are decided by either the Court of Federal Claims or by several administrative boards of contract appeals. In fact, the administrative boards issue the majority of these decisions which are an important part of the law that applies to government contracts. Contract Appeals Decisions offers the full text of every decision issued by the Armed Services Board of Contract Appeals and the Civilian Board of Contract Appeals as well as the former boards of the Army Corps of Engineers, Department of Agriculture, Department of Housing and Urban Development, Department of Interior, Department of Labor, Department of Transportation, Department of Energy, General Services Administration, Department of Veterans Affairs, and others. Expert written headnotes accompany each decision. 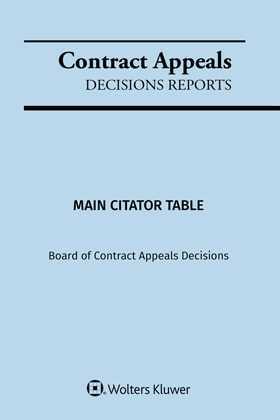 Also included are a topical index, case table, personnel listings and procedural rules for the boards, and biographies of each sitting judge. Together with the annual case book, a separate citator volume is included. Wolters Kluwer Legal & Regulatory U.S.
By enrolling a title in our Auto-Renewal Program, the title will stay up-to-date without interruption of service at the end of your subscription term, without any further action on your part, until you cancel. The renewal cost is the subscription price in effect at the time of renewal which will be invoiced, along with applicable sales tax and *shipping & handling charges. Subscription renewal prices are subject to increase in the future, however you are not required to renew any minimum number of times, and should you decide for any reason that you no longer wish a title to be enrolled in the Auto Renewal Program, or you did not intend to enroll, you may cancel at any time by calling Customer Service at 800-234-1660, emailing [email protected], or returning the invoice before it is due marked “CANCEL SUBSCRIPTION”. Enrolling a title in the program does not affect our standard cancellation policy. *Shipping & handling charges are calculated based on the weight of the product, the destination, and the method of shipment. For regular ground orders, this charge will be capped at $35.00. For shipments to destinations outside the United States: Shipping & handling charges are calculated based on the weight of the product, the destination, and the method of shipment. We will contact you as updates become available, but we will not automatically send new content. The product being ordered is an online subscription product and use of this product is subject to terms and conditions These terms and conditions can be accessed here. By ordering the product, you agree to the terms & conditions. The selected product was already added to your cart. To purchase multiple licenses please call 1-800-638-8437. Please enter the email address associated with your account. We will send you an email with a link to reset your password. Message with temporary link was not sent. Something went wrong. Message with temporary link was not sent. Email was not found. Instructions for resetting your password have been sent to your email address. If you don't see it in your inbox in the next few minutes, be sure to check you spam or junk folder. Need help finding the right solution? © 2019 CCH Incorporated and its affiliates and licensors. All rights reserved. Please enter the email address and password used at registration. This email address is not registered. Password Please enter a Password Your password must be at least 6 characters long No validation was done for leading or trailing spaces in password. This email address is already in use. Forgot Password? Create a Password Please enter a Password Your password must be at least 6 characters long No validation was done for leading or trailing spaces in password. Yes, I would like to create an account. I consent to the collection of my personal information by Wolters Kluwer Legal & Regulatory U.S., operated through CCH Incorporated and its affiliate Kluwer Law International, so that I can create an account to store my contact information and order history to facilitate ecommerce transactions. I understand that my personal information will be processed for this purpose in the United States where CCH Incorporated operates. You may change or withdraw your consent at any time by contacting our Customer Service team at +1-301-698-7100 or [email protected]. For more information about our privacy practices, please refer to our privacy statement: www.WoltersKluwerLR.com/privacy. Online subscription product purchases require that you create an account. Yes, send me information on similar products and content from Wolters Kluwer. I consent to the collection of my personal information by Wolters Kluwer Legal & Regulatory U.S., operated through CCH Incorporated and its affiliate Kluwer Law International, so that I can be contacted about similar product(s) and content. I understand that my personal information will be processed for this purpose in the United States where CCH Incorporated operates. Additionally, if the products being inquired about are fulfilled by Kluwer Law International, my personal information will be shared with Kluwer Law International and processed in the Netherlands or the United Kingdom where it operates. Thank you for your interest in a free trial! We look forward to connecting with you. Thank you for your inquiry! We look forward to connecting with you. Thank you. We will contact you soon! We apologize, but we failed to receive this message. Your request has been forwarded to a Wolters Kluwer representative who will contact you shortly!